Part 2 of my Favorite Spring Meal - Home Made Pasta with Asparagus and Lemon Sauce. 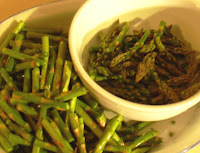 It's not spring without the bright flavor and vibrant green asparagus that heralds the coming of the new season. This part of the recipe is fast - it takes 20 minutes to make and makes enough sauce to serve 4. To round out the meal, serve it with a spring mix salad with balsamic macerated strawberries and sweet & spicy pecans. Serve a saute of julienne carrots and snow peas as a bright and colorful accompaniment. Or if you wish, seared scallops, sauteed shrimp, poached salmon or thin slices of grilled chicken are nice full proteins to add to your meal. 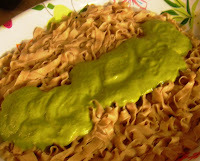 The pasta can be served as either a side or as an appetizer.